Oran Kearney welcomes Josh Carson to Coleraine. Oran Kearney has spoken of his delight after completing the signing of Josh Carson. The 23-year-old has put pen-to-paper on a two-year deal with the Bannsiders on Tuesday evening. 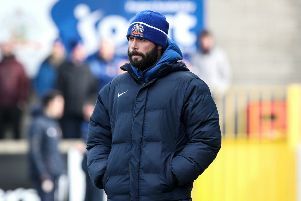 The former Linfield man, who also played for Ipswich Town and York City, has bags of experience, which Kearney feels will be invaluable. “Josh fits the bill in every way,” he said. “He may be only 23 but he has over 100 games in England behind him as well as several full international caps. “Josh has serious pedigree and quality. It has probably been a frustrating last couple of years for him though. “He came home last season and a number of clubs were interested in him. He signed for Linfield and played a lot of games at the start before breaking his toe. “When he came back they were on that fantastic run and the team was picking itself. Kearney is delighted to have completed the signing early on with European football coming up for the Bannsiders next month. “It’s always good to get your business done early, but it’s not always that simple,” he said. “You’re always looking for players, but this is the manic time of the year, you’re never off the phone. “The key thing is to bring in quality. I said to Winkie Murphy at Christmas when we were indetifying targets we need to bring in players of real quality who would challenge the players here and force them to keep improving. Carson is delighted to sign on with the Bannsiders. “I am delighted to join a massive football club who came on leaps and bounds last season,” he said.